Breaking: T-Mobile is bringing back trade-in offers for iPhone, starting on November 24 2016. Note: T-Mobile has extended their 2 free lines (or 4 lines for $120) promotion until Tuesday, Nov 22, 2016. 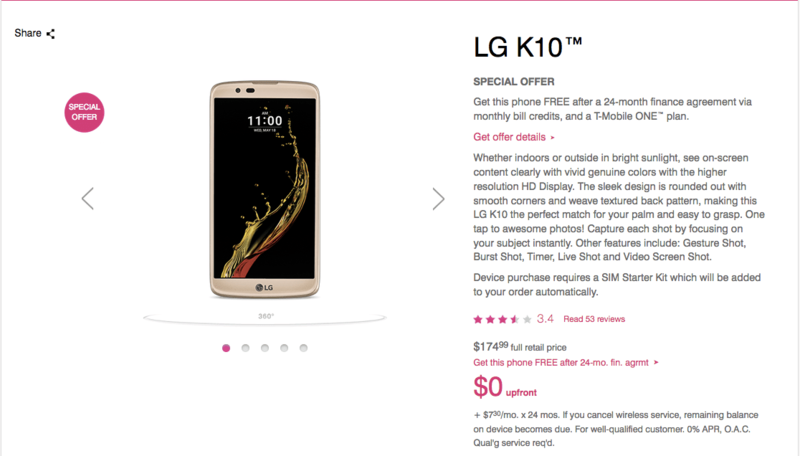 Last week, I highlighted the short-lived T-Mobile’s 4 lines for $120 limited time promotion. It was too good of a deal to pass up, especially since the savings are on a recurring basis. Apparently, I wasn’t the only one who thought the same; there was a steady stream of customers when we visited a local T-Mobile store this weekend. We switched in 4 out of 5 lines. We got an iPhone 7, iPhone 7 Plus (not in stock), an LG K10 (free phone offer) be credited back over 24 months, a LG K7 (free phone offer). We’ll switch the 5th line during the Black Friday promotion later this week. I was happy when we walked out of the store, even though the phone I got (LG K10) is a downgrade from my current device. Still I needed new phones (due to Sprint’s phone incompatibility). I didn’t want to pay full price, so I couldn’t ask for anything better than a free phone offer! “Get a Free Samsung Galaxy 7 after 24 monthly bill credits when customers trade in their Galaxy S6, Galaxy Note 5 or other device.” There is also an additional offer of a Gear VR and $50 Oculus app store gift card when customers buy a Samsung Galaxy 7 or Galaxy 7 Edge. We have a Samsung Galaxy S5 in our family plan which is not eligible for a “free” upgrade. The store rep explained the S5 can be traded in with a cost of $100 to get a new Samsung S7 (or $200 for the Samsung 7 Edge). I don’t know how easy or complex the trade-in process is at T-Mobile, but it’s great to have options to upgrade at a significant discount. 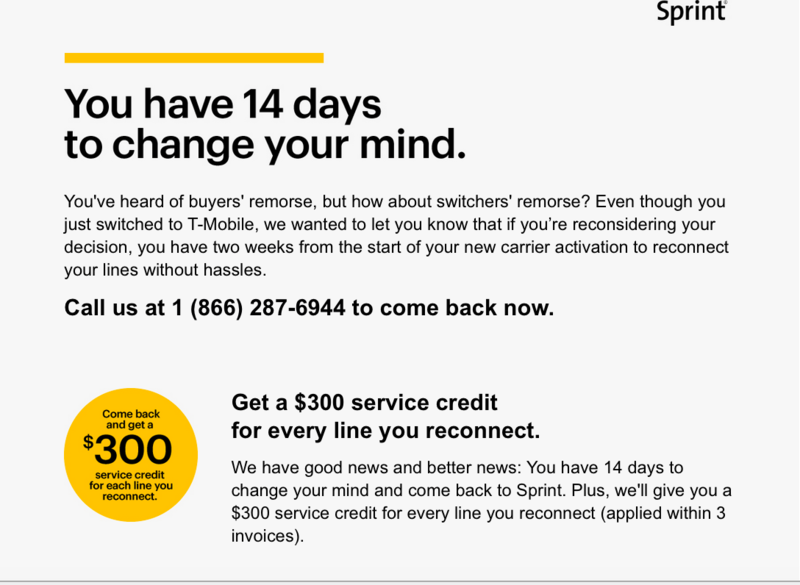 Two day after I switched, I received this email from Sprint. I generally have very positive things to say about Sprint, though I’m not pleased to have gotten this email. Where was the offer when I inquired about my options before the switch? Now that I’m on T-Mobile, I am excited about the recurring monthly savings. 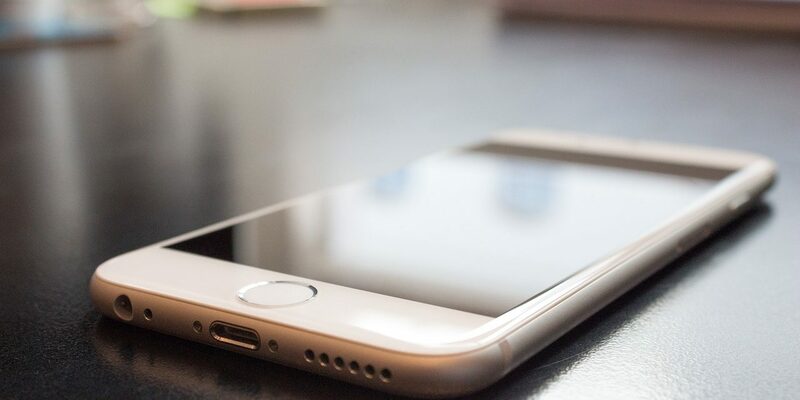 I can’t wait to use T-Mobile for international travel, and I am looking forward to trying out the mobile hotspot that comes with the T-Mobile One plan. I’m happy to say: No buyer’s remorse here. To peruse other iPhone Black Friday Deals, visit external sources. Do you plan to go out and shop on Black Friday? Have you snagged any deals so far that you are really happy about? Sound off below! ← T-Mobile’s Limited Time Promotion: 4 Lines for $120!